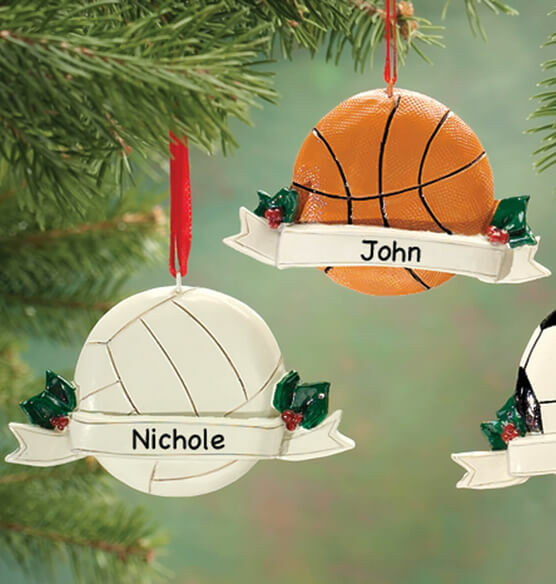 Cheer on your champion with a personalized sports ornament in winning style. Detailed in resin, scoring a victory for thoughtful giving. Approx. 3 3/4" long x 1/2" wide x 2 3/8" high. Specify style: football, baseball, soccer, basketball or volleyball. Specify name; limit 1 line, 14 letters/spaces. Each ball can be embellished with the name of a special athlete or coach. 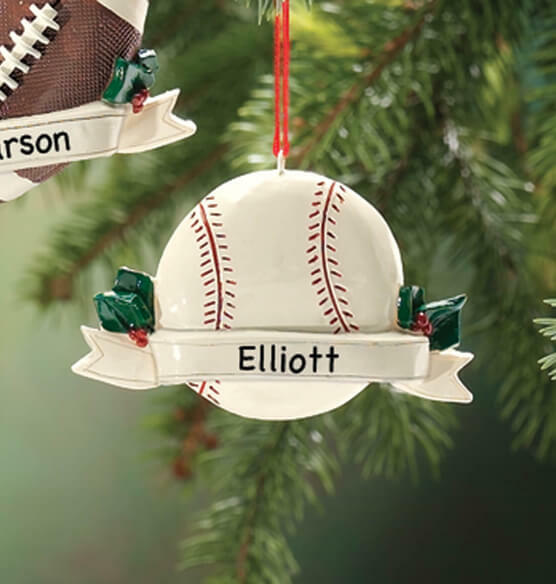 I get my grandchildren a tree ornament every and since my grandsons play baseball, I decided on the personalized baseball ornament. It did not look cheap -and it will look nice for years to come. I would recommend this ornament to anyone. It came very well wrapped in bubble wrap...with their name and year on it. Quite nice! Nicer than I thought it would be! Very nice ornament for any sports fan! Excellent purchase for a little sports enthuasist. It is a Christmas ornament. Purchased basketball for Granddaughters who play basketball in Jr. High. Very nice ornament. Personalized each and was very nice printing. Because the girls have short names, there was room to add 2018. I love the monogrammed soccer ball ornaments. I know our grandsons will love them. He loves football, so I know he'll like this. Christmas ornament for Grandson's Collection. I love it, I'll be ordering again next year for sure. For the Athlete at Christmas! 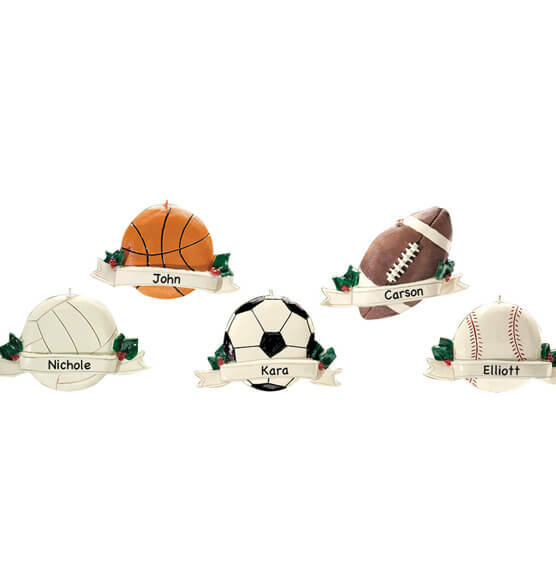 A cute sports-related keepsake ornament to give as a Christmas present. Personalizing it makes it even that much more special. I had looked lots of places and this was the one of the very few places that had the Volleyball ornament. I also purchased the Baseball and Football. They all look Great. I bought the football and baseball ornaments for my teenage grandsons. They are realistic, well made, and the personalizations are professionally done. They look like they cost much more than they did. My grandsons will love them! I bought them for Christmas tree ornaments and were loved by the people who received them. Nice to see volleyball products. I coach girls volleyball and I am always looking for a volleyball related product to give my girls at the end of each season. I buy one ornament each year for each. Christmas ornament. I am buying one item per year for each grandchild in their interests. This is for when they move out as adults they have a collection unique to their personality with year printed on it. A starter, for their own collection for thie own tree. can't wait to hang it on the tree. 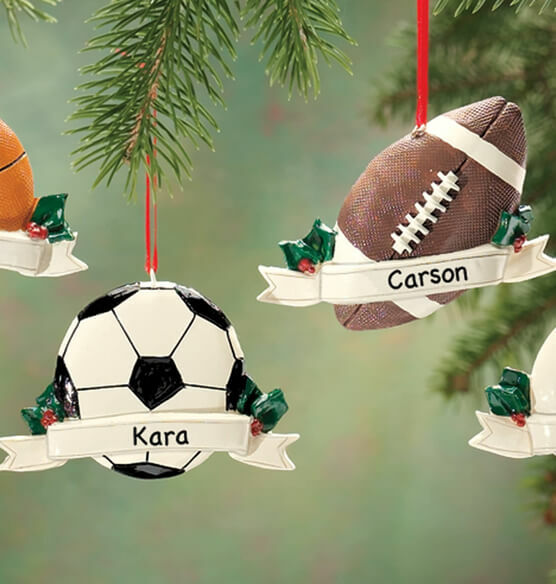 I ordered the personalized football ornament for my grandson well before Christmas and everything went through okay, I received a confirmation email for the order . Within the day of my confirmation email, I received another email stating they were backlogged and it may not be delivered by Christmas as they were out of stock. I contacted customer support to cancel my order and then I was told it would be here by Christmas. In the end I did not cancel and I received the ornament in plenty of time and it is very nice. I would have preferred to not have had the drama which is why I gave it a 4 Star rather than a 5 Star review. Every year for Christmas I choose a theme for my granddaughter for a Christmas ornament. This year is soccer; I think she'll really love it! I get personalized ornaments each year that relate to my grandson's activities that year. This time it was t-ball and soccer so those are the ornaments I will give him to put on his tree this Christmas. Great Gift Idea for team mates! Team mates really light up when they recieve a personalised gift either for a holiday, to recognise a job well done or an end of the year gift. Cute idea but should be bigger. Might get lost in Christmas tree aa it is so small.